Seems like Easter’s never gonna get here, doesn’t it, Candy Addicts? I mean, how long do we have to gaze longingly at the rows and rows of pastel sugary goodness in the aisles of the supermarket before we get to wake up to find a basket of our very own? For a quick, sugary burst of instant gratification, you simply must check out the expertly curated collection of Peeps dioramas over at Asylum.com. We’ve long enjoyed the candy-related content Asylum offers (the other stuff is pretty good too, but who wants to read anything that’s not about candy, hmmm? ), but this recent article earns them the status of Candy Darlings, no question. 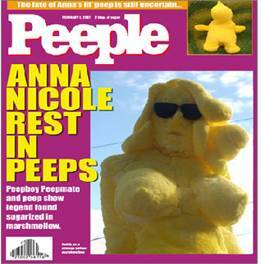 Collected therein are photos of Peeps in all kinds of crazy situations: Lord of the Peeps, Sgt. Peeper’s Lonely Hearts Club Band, Peep Jousting, Peep Brulee, and my personal fave, Peep Show.